Can you tell us about the evolution of the story into Where Are You, Puffling? When people saw that first version, they suggested it might be of interest to a publisher. I’m a big fan of children’s books, especially picture books, and I knew that if I was to submit it, the text needed to be edited before I could send it anywhere. After tidying it up best I could, I sent it in to the O’Brien Press. I soon heard back that my illustrations were getting a good reaction, which was very encouraging. However, the story needed more work, and this is where Erika McGann stepped in. Erika took on the spirit of Sean’s story, with the birds and animals helping each other out, and introduced the wonderful, cheeky puffling chick who became the star of the show. She’s done an amazing job, and I know Sean would have been thrilled with it. 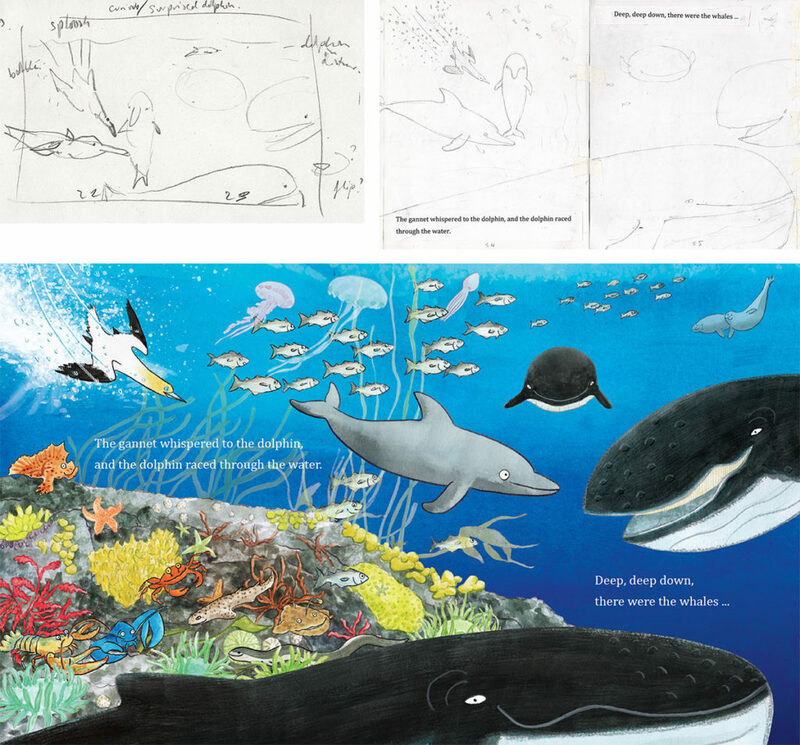 The structure of the text – starting each of the early sections with ‘Where are you, Puffling?’ – is a great help when breaking down the visuals into quite distinct scenes. 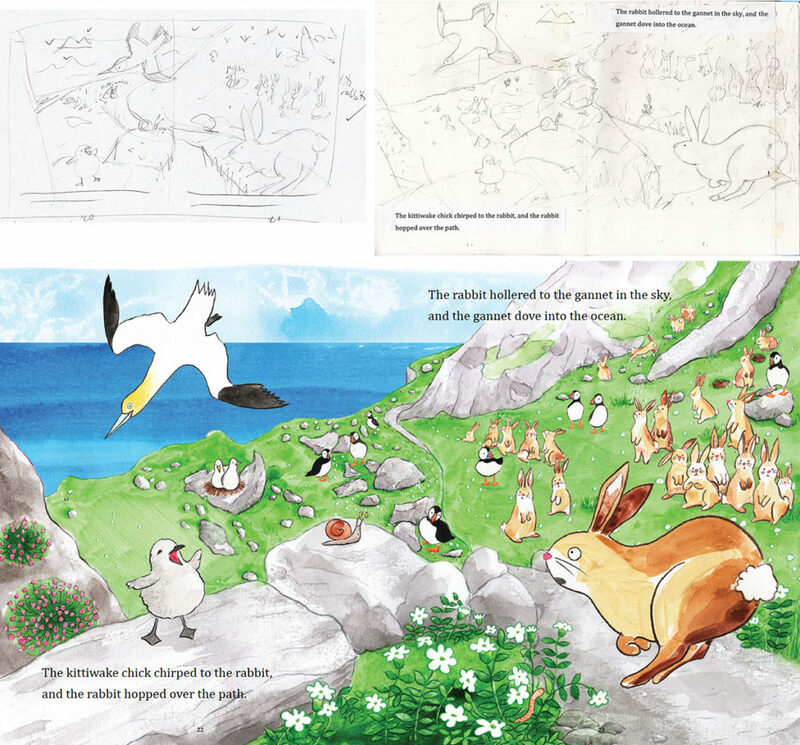 Did you enjoy illustrating the puffling and all of her furry friends on the Skelligs? Yes, it was a total joy. 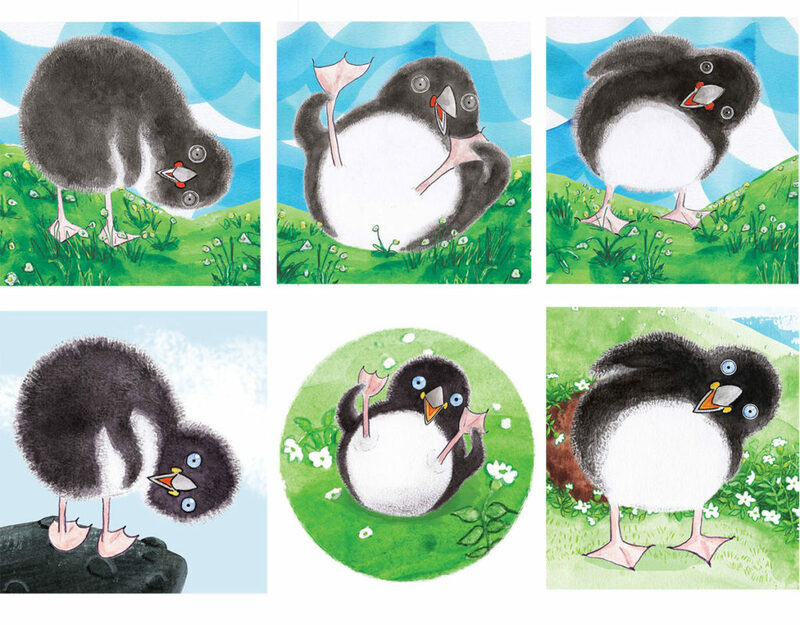 When I first read Erika’s retold story, I found myself empathising with the adventurous, curious spirit of this cheeky little puffling, and really rooting for her when the other animals came to her rescue. Pretty much straight off, I could visualise how I wanted to illustrate it, and what I quickly got down as small thumbnail sketches is actually quite close to what we have now in the finished book. 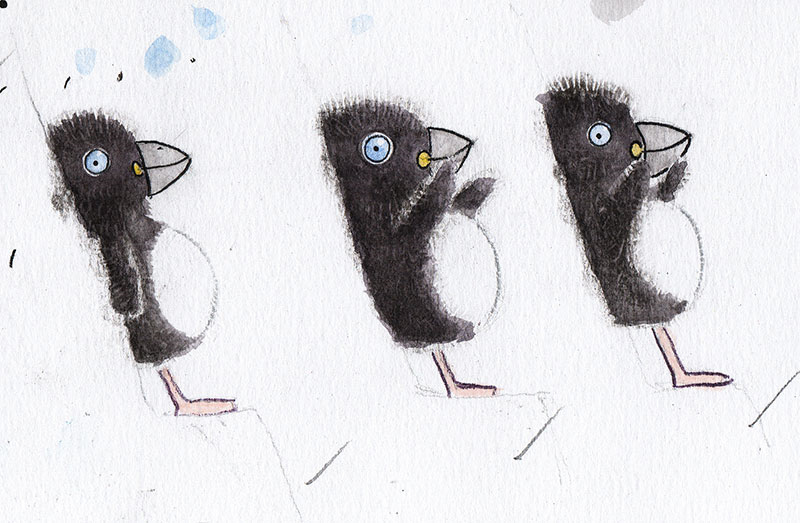 I made several character studies, especially for Puffling, to get a sense of their movement and expression. I wanted to use traditional media – gouache paints, coloured pencils and pastels – as the rough edges and happy accidents help to create a warmth in the finished artwork. Creating Puffling’s fluffiness was fun, and I loved painting the big whales. Often I created the various elements for a spread separately, scanned them into the computer, and then assembled them onto the background wherever they needed to be. Did you go to the Skelligs to get a feel for the place before you began illustrating? I paid a visit to the islands and we were very lucky to have calm weather. Skellig Michael is absolutely a must-see for anyone living in or visiting Ireland. The puffins are everywhere. They seem very much at ease, and they certainly know how to pose for the camera! I took a lot of photos as source material. Unfortunately, I wasn’t lucky enough to see a puffling – we may have been too early in the season. I had to refer to material in books and online for her. 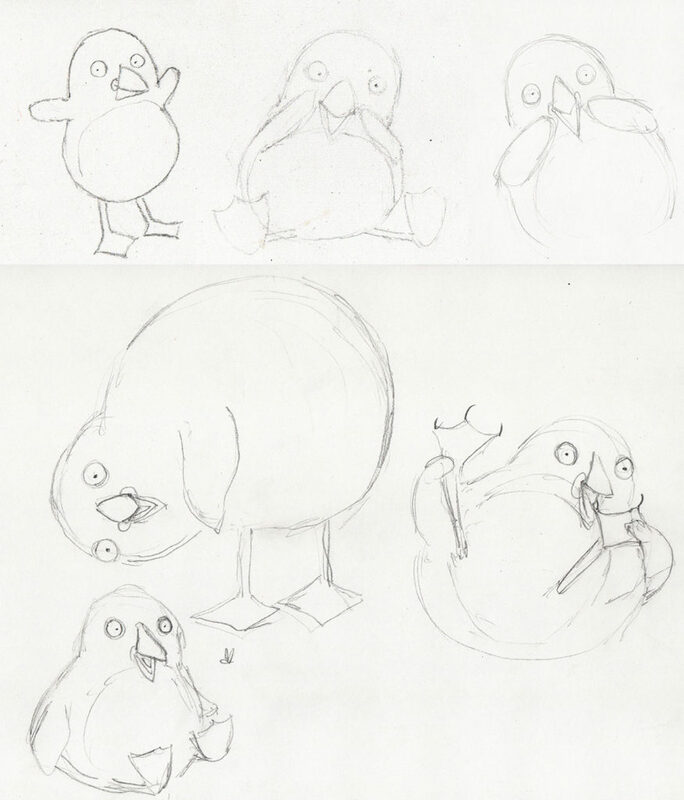 After a few sketches, I had a good sense of how I could capture Puffling’s character and movement, and I could invent the cheeky postures that I needed. I tried to convey the experience of being on Skellig, by using the whole two-page spread throughout the book. The sheer cliffs, jagged peaks, scattered rocks, very steep steps, and the amazing sea views all have a kind of magical effect on the visitor. Using the full spreads also provided room for some interesting compositions, and a sense of movement. 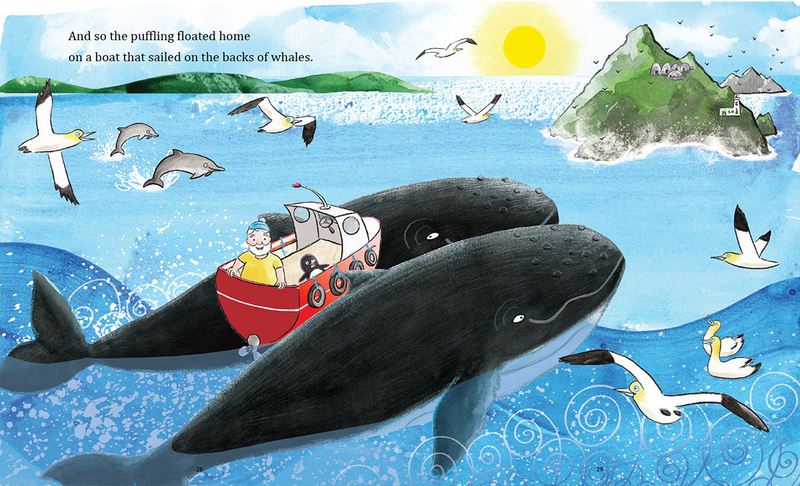 In some scenes, it’s the feeling from the text that I’ve tried to convey – the calm and relief of going home when Puffling is rescued by the whales, or the happiness of the family being back together in their cosy burrow. Did you research the animals of the Skelligs? Yes I had an invaluable guide in Skellig by Des Lavelle. I learned about the sea life around the islands, and included some of those creatures in an underwater scene. I also watched some programmes about the Irish Atlantic that had segments on the Skelligs, and the whales, but nothing can compare to making the trip yourself. Where Are You, Puffling? is my debut in picture book illustration, and it has just been great to collaborate with Erika, and all the team at O’Brien Press. I wish Sean were around to see the finished book his story has become. As a tribute of sorts, I’ve based the boatman in the book on him, with his white hair and beard, and cheeky smile. Where Are You, Puffling? is available to buy here and in all good bookshops! Where Are You, Puffling? receives financial assistance from the Arts Council.